Cataract surgery involves removing the cataract from the eye and replacing with an intraocular lens implant. Surgery is performed using anesthetic drops which numb the surface of the eye. If the patient is able to keep their eye still and maintain fixation on the microscope light during surgery this is the safest and easiest method of anesthesia for cataract surgery. Occasionally a patient will be unable to keep their eyes still during surgery. In this case an injection of anaesthetic is required around the eye. This anaesthetic will numb and eye and also paralyse the muscles so the patient is unable to move the eye. This injection can sting a little whilst being injected. On rare occasions the patient requires general anaesthesia and to be asleep to be enable the cataract surgery to take place. If you have a preference for surgery this can be discussed. When you have your lens or cataract removed you will have an intraocular lens implant inserted inside the eye to help you focus. This can help you focus in the distance. You may in fact still require a small prescription to improve your distance vision further but you will definitely need reading glasses and glasses for intermediate vision i.e. computer or piano music. Alternatively we can make you short sighted in which case you may be able to read a certain amount without glasses but you will require glasses for distance. Some patients like to have one eye for distance and one eye for near work (monovision). This can make the patient less dependent on glasses, although there is some loss of binocular/stereoscopic vision. The vast majority of people who choose this are happy but some patients are unable to tolerate the slight imbalance that occurs. You may require to have a contact lens trial to see if you are suitable for this. A multi-focal lens is able to provide some distance and some near vision. It should therefore make you much less dependent on glasses than the standard implant. However, we cannot guarantee that you will not require glasses at all. There is always likely to be a spectacle prescription that will improve your vision, on top of the implant, but we would hope that most of the time (approximately 80% of time) you would manage without any spectacles. Reading small print in poor light may not be possible without glasses. With any type of implant you will get best results if you have both eyes operated upon. We cannot guarantee, and indeed no one can guarantee, to get you out of glasses. This is despite our best efforts with up to date equipment for measuring the eye and predicting the power of the implant. Some implants only come in certain sizes and therefore if you are very short sighted or very long sighted there may not be an appropriate size of implant for you. The calculations for the power of the intraocular lens implant become less accurate if you are very short sighted or very long sighted and there is a higher risk of not obtaining the result you require and further intervention may be required. There are some eye conditions that may prevent you obtaining the best results from any of the implants that are available i.e. glaucoma or age related macular degeneration or diabetic retinopathy or corneal degenerations. One of the post-operative side effects that patients can develop are halos and glare. You may already have these symptoms as a result of your cataract. If these are noticed post-operatively they can be distracting and interfere with your vision at certain times. In dim light or darkness they may be more obvious. Particularly driving at night may be a problem as a result of halos and glare. If halos and glare are present to a degree that you cannot manage then we would require to surgically replace the implant at a further time. Exchanging implants is quite hazardous and is only done as a last resort as complications are more frequent during this type of surgery. On occasions we can get what is called a ‘refractive surprise’. This can occur when all the measurements predict a certain power of lens implant, which is then inserted, but post-operatively we can find that the result is either the production of short sightedness or long sightedness. If this is significant then on occasions it is necessary to remove the implant and replace it with a different power implant. A refractive surprise is more likely if you are highly short or highly long sighted before surgery. Virtually everybody has some degree of astigmatism which can reduce their vision without glasses or contact lens. Astigmatism in its simplest form is where the cornea or front of the eye is not perfectly round, like a football. With astigmatism the cornea is perhaps shaped a little more like a rugby ball and this can degrade your vision. At surgery we can try to reduce the amount of astigmatism, by performing relaxing incisions in the cornea to reshape it. Unfortunately it is sometimes not possible to reshape the cornea sufficiently and therefore you may still have some residual astigmatism post operatively which may prevent best uncorrected vision, which means you may still require glasses, either for reading and distance. The effect of relaxing incisions may not be permanent. On occasions surgery can cause an increased amount of astigmatism which can reduce your vision without glasses. If you have a high degree of corneal astigmatism then we can insert a toric lens implant which may be able to correct this high degree of astigmatism. Toric implants require to be inserted at a certain axis inside the eye to obtain full benefit. Occasionally the implant can rotate out of the desired axis in which case further surgery is required to re-rotate the implant. We cannot guarantee to remove all your astigmatism even with toric lens implants. This implant is able to correct corneal astigmatism as well as provide some near and distance vision. This lens is custom made for your eye. This should provide you with good vision but we are unable to guarantee that it will get you out of glasses although it should certainly make you less dependent on glasses. The Toric implant and the Multi Focal implant are known as premium implants because they are able to provide you with less dependence on glasses. You must be aware that the cost of these premium implants are much higher than the standard implant and you will be informed of prices before any surgery. If you have had previous corneal laser surgery in the past this can make predictions of the correct size/power of the implant that is required to be inaccurate. We will use our measurements and insert them in to many different formulas to try and reduce this inaccuracy but on occasions the power of the implant we insert may be incorrect. This may mean that we have to replace the implant with another implant of a different power. Exchanging implants is hazardous and we do not wish to do this unless absolutely necessary but you must be aware this is a possibility. Please note that whichever type of implant is used, that following surgery your optometrist will almost definitely find a spectacle prescription that will improve your vision either for distance or reading. This is unavoidable. The alternative to clear lens extraction of course is to continue with either glasses wear, contact wear or consider corneal laser surgery all of which are less invasive than lens based surgery. If you are considering cataract surgery then delaying cataract surgery will inevitably cause further loss of vision until you do have the surgery. If further interventions/surgery are required there may be a further charge for these procedures. With this technique the clear lens of the eye is removed and replaced with an intraocular lens implant. By altering the strength of the intraocular lens implant we can adjust the focusing of the eye. For younger patients who are either short sighted or long sighted or have astigmatism, these patients may seek corneal laser surgery to make their eyes “normal sighted” (emmetropic). In the more mature person corneal laser surgery may not be suitable or the treatment of choice to become normal sighted. In this case clear lens extraction with lens intraocular lens implant may be suitable. This clear lens surgery is exactly the same as cataract surgery. One always has to bear in mind that such lens-based surgery is approximately 99 per cent successful. If you happen to be in the 1 per cent of patients then your vision can get worse. Indeed if the eye develops an aggressive type of infection this can destroy all vision in that eye permanently. 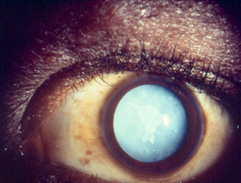 This infection (endophthalmitis) is extremely rare (1 in more than 700).